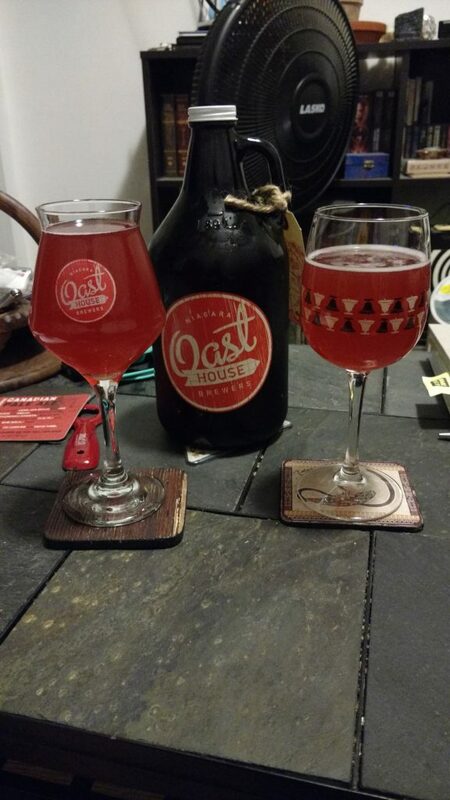 I’m surprised to discover we haven’t written about Niagara-on-the-Lake’s darling farmhouse brewery, Oast House. They are available in finer beer bars around the city, and the Barnraiser flagship beer is available at the LCBO. We certainly like them a lot – enough to factor them into our final day of our #TOBHroadtrip around Lake Erie (and home via Niagara). They have a gorgeous and inviting tasting room at the front and a relaxing back patio overlooking the vineyards. I implore you to go on your next trip to Niagara. We stopped in for a flight on Monday not long after crossing the border back into Canada. This was our first stop of the day and our palates were fresh. I discovered the Sour Cherry Berliner Weisse, their current one-off seasonal offering made with a few hundred kilos of solid sour cherries from Niagara. I was immediately in love with this 5.2% ABV option, and Kole was shocked. Shocked, since I typically find cherry-flavoured things appalling. But there is an important word there – flavoured. Since this was made with fresh local cherries, the flavour really sang to me. A growler quickly found its way into our rental car for immediate consumption – growlers really only stay fresh for about 5 days once they are filled, and should be drank within 2 days of opening. Finally, an excuse not to hoard beer! Bottoms up! Appearance: Unfiltered, deep pink hue. Thin white head that faded instantly on our first two glasses, but lingered a lot longer on the second pouring. Not sure why. Aroma: Sour and delicately sweet aroma of cherry blossoms as opposed to whole fruits. Hints of orange flesh and a faint aroma of pie crust from the malt. Taste: Very tart sour hit on the palate. Notes of green apple, tart cherries developing into an almond biscotti flavour with more pie crust. The cherry flavour is fairly soft and delicate beyond the initial sour slam. Aftertaste: Lingering tartness that is wonderfully refreshing. Possibly some brettanomyces funking this one up. Overall: Very pleasantly surprised, since I don’t like most cherry flavoured things. It was like sour cherry pie in a glass. Would be lovely during a picnic in High Park among the sakura trees. Suggested pairing: This beer is powerful on its own and is not conducive to food pairings. Have it as an apératif before dinner, or enjoy as a digestif on the patio. Drink fresh for best results – but hurry since it is a limited release!